ابتدا به سراغ bummed برویم. bummed به معنی «ناامید، مایوس» یا «ناراحت» می‌باشد و مترادف با disappointed و upset است. You look bummed. Is everything ok? Jack seems bummed today. I wonder what happened. I’m bummed. My car broke down again today. 7/24 با تلفظ /twen.t̬i.fɔːr ˈsev.ən/ به معنی 24 ساعت در روز به مدت هفت روز در هفته می‌باشد. این اصطلاح بصورت تحت الفظی اشاره به زمانِ واقعی دارد و به صورت مجازی و تمثیلی به معنی بدون وقفه و یا صرفِ زمانِ بسیار طولانی می‌باشد. The convenience store is open 24/7. I’ve been working 24/7 this week to finish the presentation. عبارتِ get out of here عموماً زمانیکه می‌خواهیم به شخصی بگوییم که از آنجا برود استفاده می‌شود اما در گفتگوی روزمره و عامیانه زمانیکه حرف طرفِ مقابل را باور نمی‌کنیم و به معنی «نه بابا (با حالت تعجب)، بی خیال، شوخی می‌کنی» می باشد. و تلفظ آن معمولاً به شکل get outta here می‌باشد. Jack: I saw Taylor Swift in Central Park this morning. Jen: Get out of here! Jack: Yeah, she was doing a free mini-concert. It was awesome. Jen: Jack, I’ve decided to quit this stupid company. Jack: Get out of here! You can’t leave. Jen: Well, I’ve already found another job! 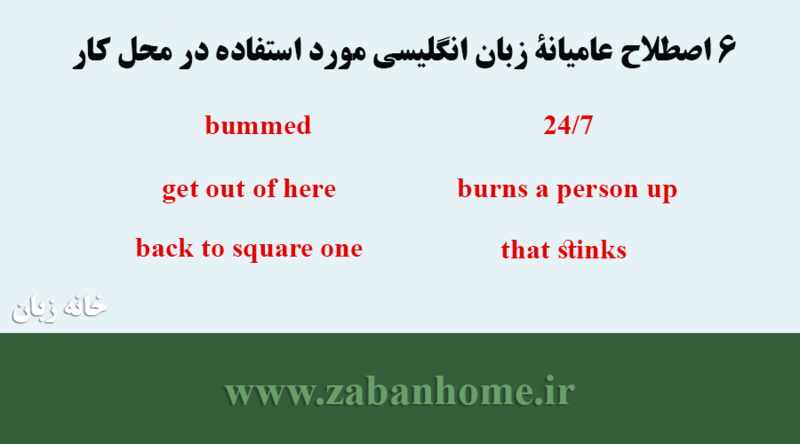 زمانیکه چیزی باعث شود شخص burns up شود آن چیز باعثِ ناراحتی شدیدِ آن شخص می‌شود. ما اغلب این اصطلاح را برای اشاره به آتش و دمای بالا برای گفتن میزان ناراحتی و عصبانیت فرد استفاده می‌کنیم. در زبان فارسی این اصطلاح به معنی “آتشی شدن یا آتشی کردن” می‌باشد. The boss made me redo my presentation. It really burns me up. Inconsiderate drivers really burn me up. The boss didn’t like my presentation, so now I am back to square one. Joe didn’t get the promotion? That stinks. The restaurant ran out of my favorite dish! That stinks. در مکالمۀ زیر شش مورد از عبارات و اصطلاحات عامیانه زبان انگلیسی مورد استفاده در اداره و محل کار که در بالا ذکر شد، استفاده شده است. Jen: Hey Jack, what’s up? you looked bummed! Jack: I am. I’ve been working 24/7 this week to finish the presentation for the big meeting next week. Jen: So, how is it going? Jack: terrible! I showed it to the boss this morning and she said it was no good. Jen: Get out of here! you worked hard on the presentation. Jack: Yeah, it’s really burns me up, so now I am back to square one. Jen: Oh, that stinks! I’m sorry to hear that.